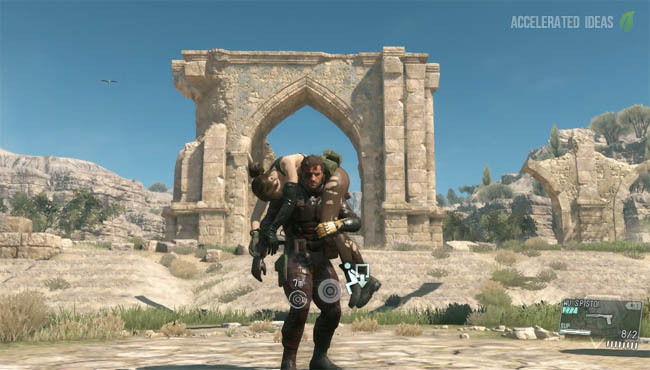 Quiet is easily my favourite Buddy in MGS 5 but using her in missions takes some getting used. The game provides a limited number of clues to her usage so in this guide I'll explain exactly how to control Quiet and get the best out of her. The first thing that comes as a surprise with Quiet is that she's not your typical human buddy. She won't follow you around like a bodyguard. Don't make the mistake of opening the context menu and selecting the Quiet option - this doesn't make her follow you or catch you up. Quiet is more of a tactical buddy that you can deploy at predesignated areas on the map - sniping points. From here, she takes up a sniping position offering both recon and attacking options for a particular area. Quiet is a strategic and tactical buddy that you'll want to deploy at key moments in a mission. This is usually once you've reached your intended target and need to build a strategy for infiltrating the area or removing a threat. She is less useful for moving between targets because she remains stationary once deployed and offers no advantage for traversing the terrain quickly. D-Horse or D-Walker should be your prefered option for moving about quickly (unless you prefer a vehicle for a mission). 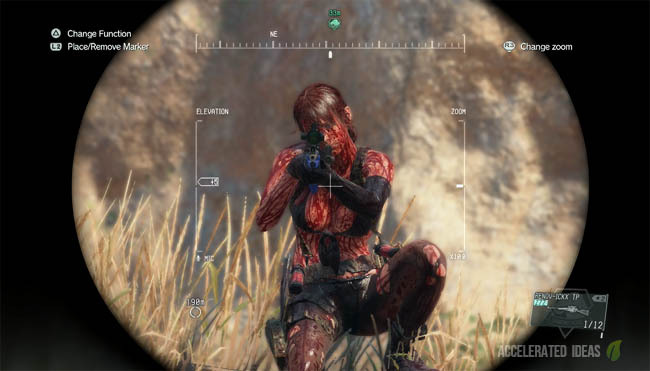 What Quiet does best is provide a second set of strategic gunfire, with amazing precision and devastating damage. Once you're good enough to unlock the non-lethal tranq sniper for her (Guilty Butterfly I think it's called) then you've got an awesome traq and fulton setup that's going to make maxing out Mother Base units a breeze. When you want to deploy Quiet you get the choice of either her Attack or Scout variation, which are both available from the iDroid Buddy Support menu. It's worth noting that you can't switch between the two without redeploying Quiet again from the menu. Scout - useful for area recon to discover enemy locations on the map. You can still use her for attacks following the recon. 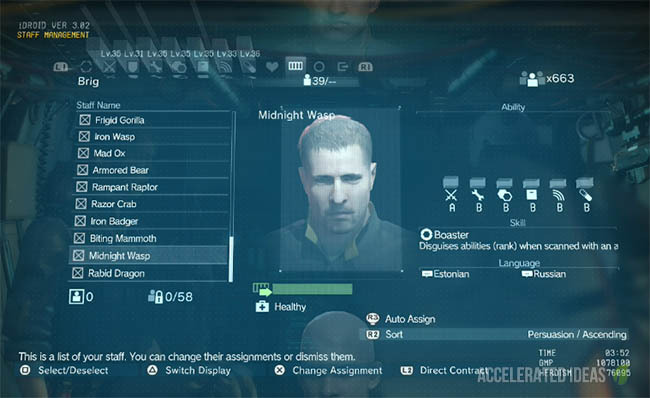 Other options such as Take Aim and Cover Me are unlocked later in the game. 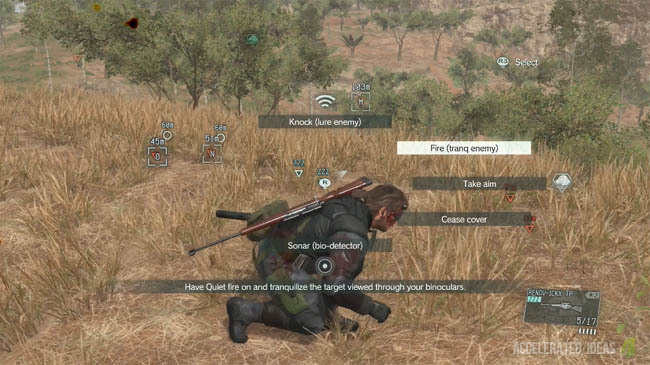 Appropriate marking of enemies will help Quiet understand which targets you want to deal with. Once you give the Fire order, Quiet will attack these targets as a priority, in the order you mark them. If you fail to mark any enemies before giving the order then Quiet will use her judgement to attack targets which either pose a threat to you or those that are within range. 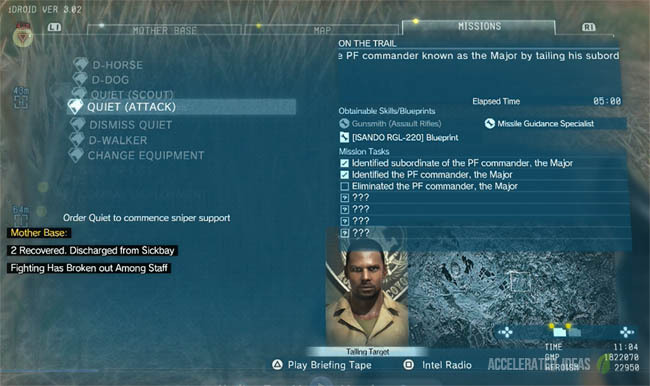 As shown on the content menu above, the Quiet menu option will tell Quiet to immediately stop what she's doing. This is particularly useful if you want Quiet to stop targetting enemies so a combat or alert status can be reduced; gunfire will of course continue to raise the guards suspicion until it stops completely. Quiet will sometimes move when she comes under attack, forcing her to either take cover or dash across the landscape looking for another sniping position. She will also hop between sniping points in close proximity. As far as I could tell there's no way to force Quiet to move to a position without opening up the iDroid and deploying the Quiet buddy to a new sniping point on the map. She will follow you to the closet point but moving long distance requires the iDroid. There's also the importance of recon - if you don't explore an area then you won't unveil new sniping points for Quiet to use. She won't just scout a base herself looking for new sniping points - you need to help her. Fire option is grayed out, why? Sometimes you will open the context menu, wanting to select Quiet's Fire option only for it to be disabled (grayed out). The explanation for this is simple, either she's in the middle of shooting the enemy or targets are out of range. It appears that as you move closer to enemies, the Fire option becomes available. Therefore, you can't mark a tonne of enemies, deploy Quiet and then leave the scene - you still have to be part of the action.